Nth Ascension was conceived of in 2009 and by January 2010 became a reality under the name Nth Degree as a four piece (Darrel Treece-Birch, Craig Walker, Martin Walker and Alan ‘Spud’ Taylor). By 2011 the name had been changed to Nth Ascension and their “live” demo album “Frequencies of Day & Night” was recorded. In 2013 Gavin Walker joined on bass and they began writing and recording their very successful album Ascension of Kings, released in 2014 on Aurovine/Sonic Vista. 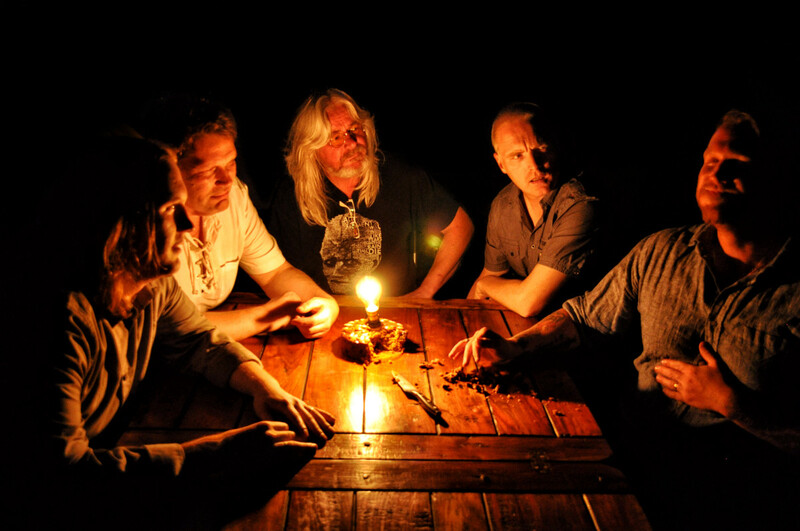 Nth Ascension became a member of the MRR Family in February 2016 and released their sophomore album ‘In Fine Initium’ to critical acclaim in November 2016 on Melodic Revolution Records. 2018 sees the band in the practice studio for two live performances in the UK in early and late summer respectively. It’s been a busy year for Nth as they continue writing their new album and will be in the recording studio later this year with the album being released in early 2019 on Melodic Revolution Records. Alan started singing at about eight years old. Like many young musicians, he would sing the chart hits of the time whilst at school and his friends would listen; captivating his friends with renditions of Elvis songs popular in the day.Alan was born into a musical family with both his Mother and Grandmother having sung in the clubs of the time and his Grandfather would play drums. Singing and performance were born to him and in his blood so to speak. He started playing guitar around the time he left school and was initially self-taught sharing his brother’s classical guitar. Many of the first tunes he learned were from his brother who was taking classical guitar lessons. In 1986 Alan met Darrel Treece-Birch (TEN and Nth Ascension) which would begin a thirty-year friendship and music collaboration and the first fruits of their progressive style started to take root in the band ‘Purple on the Storm’. During this time Alan took formal voice training with the professional Tenor Lanceford Roberts. Craig was barely old enough to walk, but his rhythmical ability was already apparent as he would play along to Queen’s ‘We will Rock You’ in perfect time. Throughout his school years, he played drums in school productions and for his local church in Fleetwood. Darrel Treece-Birch, is a keyboardist, multi-instrumentalist, composer, producer, and an accomplished mix/mastering engineer. His first performance was at the Fleetwood Marine Hall in 1975 as a very young 8-year old and he has not stopped performing since. His professional music career spans more than 30 years and he shows no signs of slowing down, in fact, Melodic Revolution Records expects to be releasing his next solo album later in 2018. Darrel has released three solo recordings with Melodic Revolution Records, ‘Celestial’ (2015), ‘No More Time’ (2016) and ‘Healing Touch’ (2017). Healing Touch eloquently show-cased Darrel’s musicality including all instruments being played by him; including the production, recording, mix/master engineering of the album, which was all Darrel. To complete this one-man project Darrel created the artwork for this release an original acrylic painting entitled ‘Starting Again’. Creating his own artwork is not new, Celestial album art was also an original painting by Darrel and the No More Time photo cover featured the artistic talents of his son Luke Treece-Birch. Inspired by the early Electronica music of Oxygene and Equinox by Jean-Michel Jarre and ambient orchestration of Vangelis he bought his first synthesizer (Korg DW6000) at age 17. His inspirations came from Marillion, Yes and Genesis which propelled him into a band at 17, Fleetwood-based ‘Purple On The Storm’ where he would meet his long-time friend and writing partner Alan (Spud) Taylor. The band names changed throughout the years, but the members stayed fairly consistent including guitarist Martin Walker (Nth Ascension). Today alongside his solo work, Darrel plays keyboards with the British Hard Rock/Melodic Rock band TEN whom he joined in 2011; also writing/recording and performing with original progressive rock band Nth Ascension. Gavin is from a musical family, together with brother Craig, grew up surrounded by the music of Martin (Dad) Walker, Darrel Treece-Birch and Alan “Spud” Taylor – some might say they were ‘pickled’ with their music from a very early age. Gavin started out with the guitar but he eventually settled into the bass guitar and spent many formative years learning to play the blues and jamming often with Craig in their living room to the likes of Queen, Metallica, and Nirvana. Having been raised in a musical environment long jam sessions with his brother and father was the natural progression of his exploration as a musician from learning others works to experimenting and creating his own sound and style. In his college days, Gavin was involved in the band ‘Angel Hill’ which gained some popularity locally, winning the local ‘Battle of the bands’ contest in 2000. In 2002 Gavin joined the group ‘The Field’ as a second keyboard player/percussionist. 11 years later in 2013, Gavin the latecomer to the land of “Nth” joined the band just in time to play his part on the album ‘Ascension of Kings’ and is now currently collaborating on the next Nth Ascension album with the band.